Welcome to WORK Wheels New Zealand. 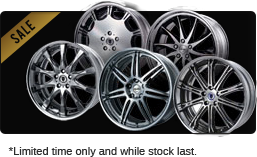 As the only authorised distributor of Work wheels in New Zealand, we are pleased to be able to offer you the full range of wheels from one of the worlds leading manufacturers. And yes, you can buy direct from us. All quoted prices include GST and delivery. Please browse through the wheel pages and contact us for further information. We have the expertise to advise the correct fitment for your vehicle.